Ray Masters was recently asked to add his artistic voice to an impressive list of fine artists and entertainment stars in support of the Paia No Mo’ Plastic campaign. Ray was joined by several famous supporters of the cause including Peter Max, Willie Nelson, Laird Hamilton, Woody Harrelson and Jack Johnson. Their quest was to raise cash to provide eco friendly bags to all of the merchants of Paia for a period of at least 3 months. 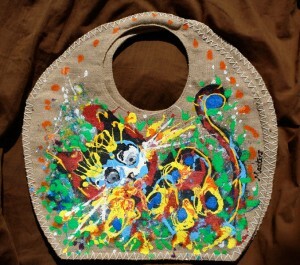 The bags were auctioned off over a period of 3 months at the official No Mo’ Plastic Bags site.